Mister Spex, Europe's leading online optician, offers with its own brand TrueLens, high quality contact lenses at an unbeatable value for money. These premium lenses are particularly comfortable to wear since they are made of silicon hydrogel. This innovative material increases the oxygen permeability and supports your eyes' long-term health. Additionally, 85% of UVA and 96% of UVB rays are filtered out by the integrated UV protection in order to protect your eyes from intense sunlight. This lens' improved oxygen circulation and moisture retaining wetting agent in the lens solution ensure your eyes are hydrated - all day long. 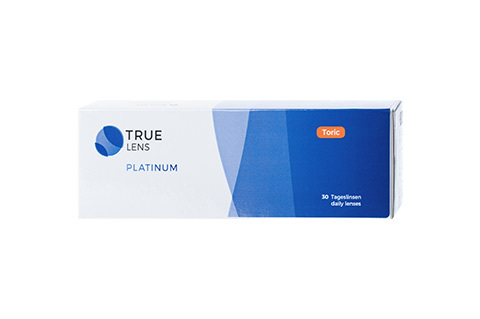 The TrueLens Platinum Daily Toric is a toric daily lens that was specifally developed for those with astigmatism. In order to correct the irregular refraction due to the deformed cornea, this lens disorts objects on purpose. The TrueLens Platinum Daily Toric corrects this situation specifically and allows for an optimal visual acuity. Furthermore, the innovative Optimised Toric Lens Geometry™ improves the stability of the contact lenses in the eye and reduces the rotation of the lens due to movement of the eye or eyelid. With thanks to the use of the latest soft silicon hydrogel, the natural moistening of the lenses and oxygen permeability is guaranteed - for a comfortable, long-lasting wearability and long-term healthy eyes. Please note the instructions for the use of contact lenses.